Which Clubs in Las Vegas play Electronic / EDM / House Music / Dance Music? Electronic Dance Music has taken Vegas by storm. 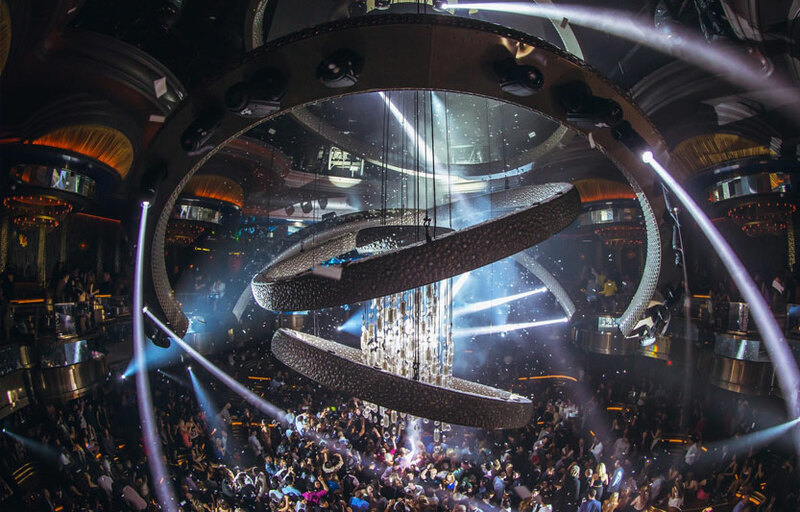 It’s actually not that difficult to find a club in Vegas that plays EDM music – all the hottest clubs in Las Vegas now feature the top electronic DJs in the world. If you’re looking for electronic / house music – you’ve come to the right city. Vegas is THE new EDM mecca. Period. If you’re into hip hop music, Heart of Omnia is a separate area within Omnia that features a hip hop DJ. Now entering it’s 6th year of operation, XS at the Wynn is still the undeniably the King of Clubs. Often considered by many to be one of the “most luxuriously designed nightclubs on earth,” XS continues to win five star rankings and adoration from club goers who enjoy the 40,000 square feet of sprawling dance floor, outdoor patio, and pool area, The design was inspired by the curves of a human body and it boasts a 10 foot rotating chandelier and rich gold, black and brown color scheme. Resident DJs at XS include Avicii, David Guetta, Alesso, Kaskade, Zedd, Major Lazer, Martin Solveig, and Diplo. A Vegas trip is not complete without a night at XS. Hakkasan is Las Vegas nightlife’s crown jewel. Located in the MGM grand, Hakkasan features 80,000 square feet and five levels of dance floors, lounges, and restaurants. The first two levels feature the main restaurant, serving masterful Cantonese cuisine from Chef Ho Chee Boon. The third floor is comprised of the Ling Ling Lounge and the Ling Ling Room — over 10,000 square feet of dance floor and lounge. Ling Ling room DJs play hip-hop music; the main room is almost always electronic/house music. The top two floors are the main nightclub and upper balconies, where the resident DJs Tiesto and Calvin Harris spin regularly. Other resident DJS include Dada Life, Sebastian Ingrosso, The Chainsmokers, Steve Aoki, Lil Jon, Borgeous, W&W, 3LAU, Axwell, and Showtek. The dance floor is surrounded by numerous VIP tables arranged in a semicircle facing the DJ booth, giving every table a great view of the DJ. With its giant LED screens, intense light shows, and world-class performers, Hakkasan is one of the most luxurious and exclusive clubs in Las Vegas. Marquee Las Vegas is 60,000 square feet tribute to the clubbing gods – featuring a rooftop patio with breathtaking views of Las Vegas, an ultra pool-club and the best DJs from around the world. Marquee Nightclub & Dayclub showcase internationally acclaimed resident DJs such as Dash Berlin, Benny Benassi, Gatlantis, Cash Cash, Porter Robinson, EDX, Carnage, and DJ Vice. If you haven’t jumped on the EDM bandwagon, fear not – Marquee also offers the ‘Boom Box’ as a hip hop room, as well as ‘The Library’, a discreet VIP lounge if you’re feeling something more low key. With vast glass window-walls overlooking the famous Las Vegas Strip, guests will enjoy a nightlife experience unlike any other venue. As soon as you walk through the front doors of Surrender–also known as Encore Beach Club during the day–you immediately know you’re in for a treat. The first thing you will notice is the massive, green-eyed serpent behind the club’s main bar, alluding to the tempting libations and perhaps, the temptations of Sin City itself. Surrender features three fully stocked bars, VIP booths along the dance floor, cabanas and daybeds near the pool, and stripper poles for gorgeous go-go dancers. When you’re ready to take the party outside, Surrender has you covered too. The outdoor area features poolside VIP tables, two levels of cabanas, booths, couches, bungalows and plenty of space for dancing wherever you’d like, with palm tree décor and a more casual vibe. There are 26 cabanas that are well-furnished, including flat-screen TVs and balconies overlooking the Las Vegas Strip. During the winter, a climate-controlled dome covers the pool area. Surrender’s resident DJs include RL Grime, A Trak, Dillon Francis, Yellow Claw, Skrillex, Flosstradamus, Diplo, and DJ Snake. Depending on the DJ and the night, the music may skew more hip hop / dubstep / trap / dirty EDM. Make sure to do your research on the DJ spinning that night! Checking in at 38,000 square feet, Light is the first-ever nightclub turned on by Cirque du Soleil, merges cutting-edge creativity with incredible music to produce a new kind of nightlife experience. Headlining DJs lead the charge, coupled with exclusively built performance elements & a gigantic LED screen showing visuals, innovative video mapping, lighting, sound & special effects, as well as avant-garde costumes & unique choreography. Light is a must see venue leaving you with a truly unforgettable night. Light no longer features the same level of EDM talent that it once did. Resident DJs include Morgan Page, Baauer, Stafford Brothers, Laidback Luke, DJ Mustard, and Disclosure. Depending on the night, the music might be a mix of house and hip hop. Make sure you do research on the DJ while planning your trip! Although the talent is no longer top tier, Light does have bottle service options that are pretty good value. The guestlist at light is also usually free and comes with drink tickets. Get on the app for guestlist and bottle service! Since its opening in Sept 2005, this Asian themed dining and entertainment venue at the Venetian has been consistently amongst the top grossing nightclubs in the world. The multi-faceted 3 story “Asian City” houses a restaurant, banquet facilities, lounge, nightclub, and beach in over 60,000 square feet. The extensive menu incorporates culinary components from China, Japan, and Thailand. Open Thursday – Saturday, Tao is a frequent hot spot for A-list celebrities, sports stars, and culinary connoisseurs. This nightclub features top DJ’s such as Snoop Dogg and Jermaine Dupri, and creative programming. It’s important to note that Tao is not a pure EDM club – the main room plays a mix of top 40, EDM, and hip-hop while the Opium Room down the hallway is catered more towards those who appreciate hip-hop music. Those of you looking for EDM only clubs should steer clear.